The other day I watched Whiplash. The movie left quite an impression on me because I could relate to both the drummer kid and the abusive teacher. Perhaps the most powerful part of the movie is that it makes it so hard to pick a side. Who can judge a kid’s determination to be the best? What if the teacher had never pushed him beyond his limits? Would he have been able to break through to his greatness without that? Was the teacher doing him a service, delivering him to an outcome that he so desperately wanted? What was the driving force that made him want to be one of the greatest drummers of all time? Was that ego or his very deepest calling? The movie made me think of the relationship between mastery and greatness. I think of mastery is an internal relationship, a deep understanding and skill at some subject. Greatness is an external relationship, a measure of impact or recognition. The line between the two can be blurry, as true mastery often elicits greatness. But the question is: what is the underlying motivation for a person? The call towards some form of greatness can be torture. I feel it acutely myself and I feel the pain of it’s call on a daily basis. It’s a pushing driving force that has been present since I was a child. It is only now as I get older that I can begin to differentiate between a call to mastery and a call to greatness. And deeper still, I can see how it is woven with a fear of insignificance and a fear of not being enough as I am. As I bring more awareness to this inner dynamic, I know that what I really aspire to is the satisfaction of true mastery without attachment. Despite this awareness, understanding the different motivations within myself can be challenging. There is undeniably an aspect of myself that wants to have a significant positive impact on the world. I’m rarely satisfied with the prospect of something being small scale and I am left questioning whether this is just my nature or somehow ego driven. The awakened sages call a person wise when all his undertakings are free from anxiety about results; all his selfish desires have been consumed in the fire of knowledge. The wise, ever satisfied, have abandoned all external supports. Their security is unaffected by the results of their action; even while acting, they really do nothing at all. Free from expectations and from all sense of possession, with mind and body firmly controlled by the Self, they do not incur sin by the performance of physical action. A desire for greatness or impact seems to reflect an expectation for a particular outcome – one that can’t necessarily be controlled. I can pour my heart into something, engage every personal faculty, possibly attain some form of mastery, and experience deep joy in the process. But as soon as there’s an ambition for external impact and recognition, the whole process can become stressful and frustrating. So much so, in fact, that it can hinder the process of mastery itself. Ego is interesting in this sense, as it can be both a driving force and a blocking force. 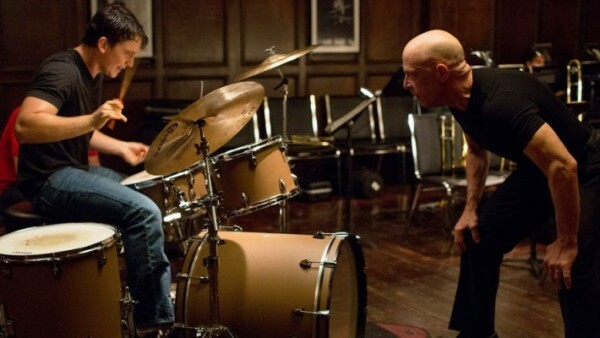 In Whiplash, how much of the boy’s behavior is motivated by ego and how much is motivated by a deep inner passion? The two are not easily separated and the boy is likely driven by both. At one point, when get gets kicked out of school, he seems to give up drumming entirely. His ego is so attached to the external expectation of greatness, that he gives up his calling entirely when it seems that that recognition will not be possible. Then in the ending scene it appears as though the drummer transcends himself, he breaks through his own limitations, breaks through his own ego shell. But wasn’t it his ego that helped him break through his ego? Wasn’t it his ego that drove him madly to this point of being able to overcome human limitation? The challenge here is that there isn’t a black and white answer. Does the boy’s desire for greatness cross a line? Don’t we all benefit from the true mastery of others. When we encounter it in music, art, or science, it moves us. Yet when we see what lengths people have gone to for such mastery we are often disturbed. Do these polarities always go hand in hand or is it possible to find this true mastery without the dark side of getting there? I’m not sure there’s a clear answer, but, if there is, surely it lies in cultivating increasing awareness around one’s inner and outer landscape.